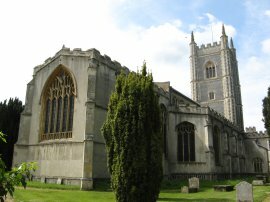 I did this walk on the 10th May 2009, driving up from London and parking in the small car park close to the church in the little village of Boxted. My parking place being conveniently located at the exact spot I had finished my last walk along the Essex Way just under a month earlier. From the car park I headed along a narrow hedge lined footpath that runs round the back of the church to reach Church Road. From here I continued ahead along the road as it made its way out of the village and in to Lower Farm Road. The road descends gently downhill, occasionally giving good views across the valley of the River Stour, photo 2. Leaving the road, the Essex Way joins a track on the right, running alongside a patch of woodland. The route passes a pond before heading uphill along the farm track to reach the farm buildings at Rivers Hall. Here the route skirts round three sides of the farmyard, photo 3, before continuing along a field edge path to join Sky Hall Hill Road. 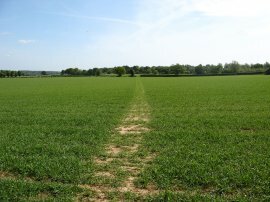 The route leave Sky Hall Hill on a footpath that crosses over a corner of a field, photo 4, where it was pleasing to see the route of the route of the footpath had been clearly marked over the field before following the field edge to a road. 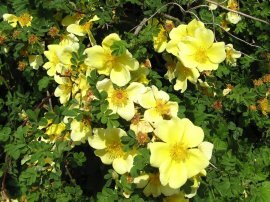 In the hedge was a pretty yellow rose in flower, photo 5. 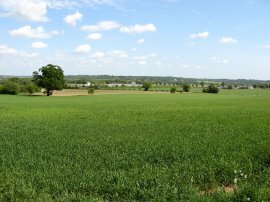 The route heads across the road and over more fields where once again there were good views over the surrounding countryside, photo 6. 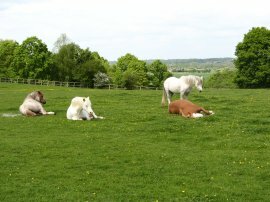 It was a very pleasant sunny day and all the fields, trees and hedges were considerably greener than when I had been out last month. Crossing a final field, photo 7, the route continues ahead along a minor road before taking another footpath on the right that once again heads off over fields, before joining a field side path. I went slightly off course at this point as the Essex Way takes a footpath that heads up a field on the right while I continued ahead along side the field edge before turning to my left at the end of the field! 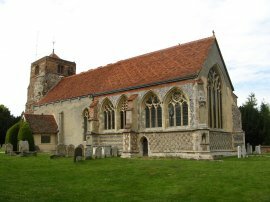 As is usually the case I soon realised my error and got back on track heading uphill towards the Church of St Mary the Virgin at Langham, photo 8. 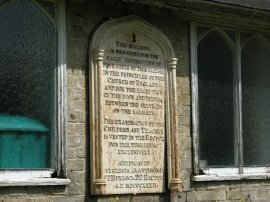 In the north west corner of the churchyard there is a small building erected by Dr Hurlock in 1832. 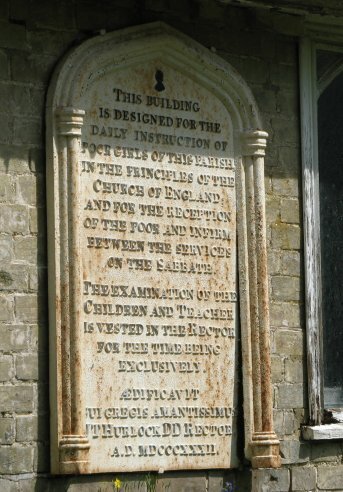 Originally a girl's school on weekdays and a resting place for the poor and infirm between services on a Sunday, as recorded by a plaque on the wall, photo 9. Just past the church the route joins a driveway which is followed to the left with trees on one side and fields on the other. This track eventually heads down to join a road at Gun Hill. Here I turned to the left for a short distance before crossing the road and heading to the right down Stratford Road. The junction is on a bend and it did not seem to be the safest place to have to cross the road, even though the road was a fairly minor one. Stratford Road then crosses over the A12, the noise from which had accompanying me for some time, before the Essex Way heads off to the left along the driveway of a hotel and restaurant. 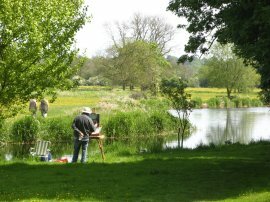 Just before the main car park is reached the route joins a footpath on the right that heads through a small section of trees to briefly join the banks of the River Stour where I spotted a latter day Constable painting besides the river, photo 10. 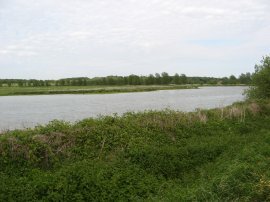 The path soon leaves the river, following a track along the edge of fields to Bridges Farm before heading past the farmyard and on to join Dedham High Street. Here the Essex Way turns to the left through the centre of the town, which due to its location in the heart of what is known as "Constable Country", after the painter John Constable who lived and worked nearby was very popular with tourists which came as somewhat of a shock after the generally isolated paths the Essex Way had been following. Just past the Church of St Mary the Virgin, photo 11, the Essex Way joins a footpath that runs down between houses and across a playing field. Reaching a cricket club house the route turns to the right before taking a footpath on the left that heads though the trees that line the cricket pitch and into fields. There now followed a stretch of several miles where I took hardly any photo's which for me is very unusual, I often feel I spend as much time stopping to take photo's as I do walking. However, whilst the countryside was still very pleasant there was not anything that was really very different to what I had already seen before. The route heads across a number of small fields and paddocks before bending road towards Park Farm to join a track that runs up to Coopers Lane where the route then turns to the right. 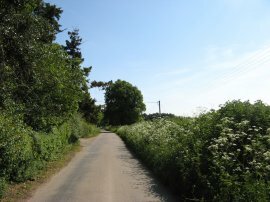 The route follows the road up towards the end of Coopers Lane before joining a driveway on the left. The route then heads up this before turning to the left to pass through the front garden of a house before joining a footpath that heads to the right round the back of the house. The route was a bit obscure at this point and it took me a while to realise the path did indeed pass to the left in front of the house rather than continuing ahead into a large open garden from where I could here what sounded like a church service taking place, very unusual. Leaving the house behind, the path heads up over a small stretch of field to reach Castle Hill. Here the route turns to the right for a shore distance before turning left into Anchor Lane. This road bends almost immediately to the right however the Essex Way continues ahead to once again head out over fields on a fairly straight course to East Lane. 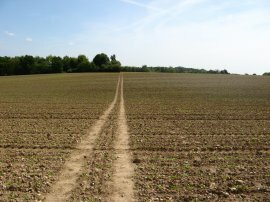 Here the route turns to the right, heading gently uphill along the road before taking a footpath on the left that heads diagonally across a field to Long Road East. 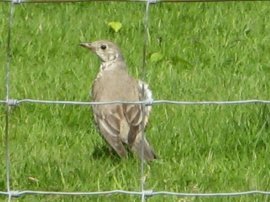 In this field I spotted the Thrush in photo 12, a bird I don't see very much when I am out and about now. The path also took me past the horses in photo 13, which had left trails of horse hair from where they had been rolling in the grass. Crossing over Long Road East I continued ahead over more grassy fields before heading downhill to cross over some railway lines and the narrow Shir Burn. 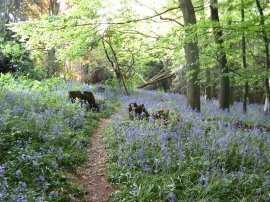 There is then a short, slightly steeper uphill section of path through a patch of woodland which leads up to another farm track running along a field edge. 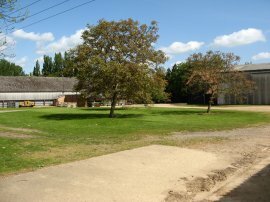 The route follows the track as it bends to the left and heads down to pass in front of a an isolated house before continuing on to the right down to join the road at Mill Hill. Here the Essex Way heads to the right for a short distance as the road become Dedham Road. Just past a sharp right hand bend the route joins a gated driveway the heads off to the left. 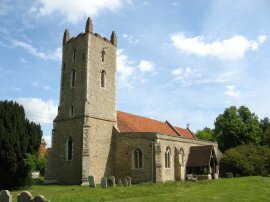 The route then joins a footpath on the right that heads across the corner of a field to reach St Mary's Church at Lawford, photo 14, where I ended this stage of my walk. On reaching the churchyard I had walked a further 9.27 miles along the Essex Way and was also able to gain my first views of the Stour Estuary which I will be walking along next time around. From the churchyard I joined footpath that headed downhill towards Manningtree Station, photo 15. 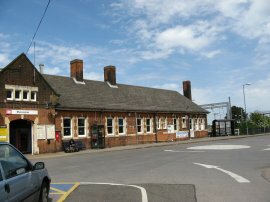 As well as being the start point for my next, and final walk, along the Essex Way, Manningtree Station also marks the start of the St Edmund Way and I followed this path for the first 5.75 miles of my journey back to the car at Boxted. 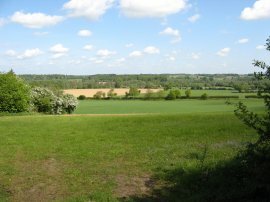 The initial stages of the route was rather dull as it headed away from the station along a fairly enclosed track running between fields however things improved considerably as the path reached the banks of the River Stour, photo 16. The route follows the edge of the floodplain and crossing a dry weir I stopped for my lunchbreak, sitting on the concrete in the warm spring sunshine. For the last few miles I had felt a blister developing on the heel of my left foot and despite re-arranging my sock and boot nothing seemed to relieve the pressure. After my lunch stop my foot started to feel even worse and the next six or seven miles walking was quite painful and slowed me down quite considerably. I did try putting a blister plaster on my heel but as the blister was in the flat of my heel this just added a bump, and more pressure, to the sore spot so this got removed a mile or so later. Even a week or so later when I'm writing this I'm still at a loss as to why I developed such a deep blister on the sole of my heel, I was wearing my normal boots and socks. Fortunately it healed very quickly and I was able to do a 17 mile walk the next weekend without problems, apart from another big blister at the front of my right foot which again developed on the sole of the foot, not to far back from my middle toes. However because of its location this blister didn't really hurt much at all. Perhaps they were a legacy from all the time spent swimming and running around in bare feet at Centre Parcs the week before this walk. 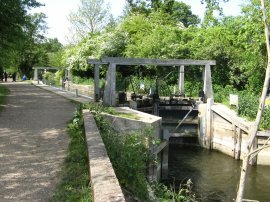 Anyway from the weir the path soon joins the main channel of the River Stour as it heads up to Flatford Mill, photo 17 and the nearby Flatford Lock, photo 18. The area around the mill was packed with people and the rowing boats were doing a brisk business. 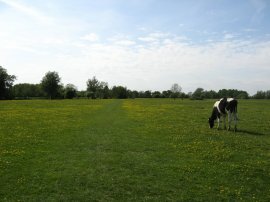 From the Flatford I headed across the grassy meadows besides the river, having now also joined the route of the waymarked Stour Valley Path, (not to be confused with the Stour Valley Walk that I did between Lenham and Pegwell Bay). Leaving the hoards of people walking to Dedham the route crosses over the river, photo 19, at Fen Bridge and heads briefly away from the river before turning to the left through a patch of trees and heading back across the meadows to the river edge, photo 20. 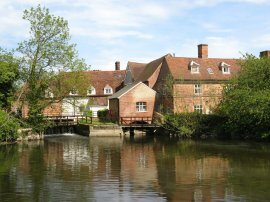 After a brief blister enforced stop I continued along the river bank, crossing a road by Dedham Bridge and Dedham Mill where the peace of the countryside was briefly disturbed by a singer performing rather loudly outside a riverside pub. Once over the road I continued alongside the river, eventually reaching an underpass under the A12, close to where I had photographed the painter on the opposite bank earlier in the day. 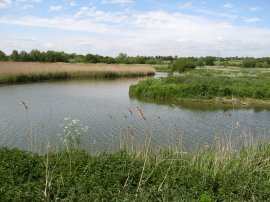 Once under the A12 I turned to my right along a road that leads towards the village of Stratford St Mary. 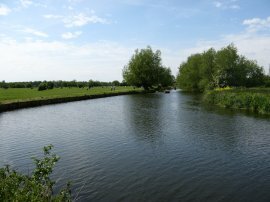 The route leaves the road along a footpath that crosses back over the River Stour before heading diagonally to the right across a large open field to once again join a tree lined path running alongside the river bank. 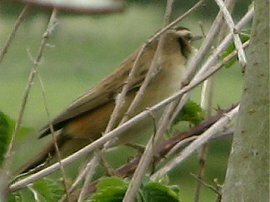 In one of the hedges I spotted the Chiffchaff in photo 21. Leaving the course of the river the route passes a large pond, photo 22, which was not marked on my map and which I think maybe a flood control feature, before heading alongside a number of fields to eventually reach a the end of a road by a pumping station. It was at this point I left the routes of the St Edmund Way and Stour Valley Path as I headed along the road which bends to the left, gradually heading away from the river. After another brief blister enforced stop I then joined the first road on the right which I followed down to a T junction where I continued ahead along a footpath that heads uphill between fields. 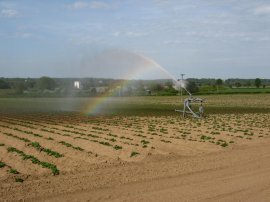 In one of these fields a large sprinkler was being slowly dragged across the field, producing a colourful rainbow effect with the spray photo 23. Reaching Sky Hall Hill I turned to the left along the road, eventually linking up with my outward route which I then followed back to the farm buildings at Rivers Hall Farm. Here I took a slightly more direct route back to Boxted, joining a footpath that runs downhill through trees, photo 24, before heading back uphill over fields to join Church Street on the outskirts of Boxted from where it was just a short walk along the road and through the churchyard back to the car. Back at the car I had walked a total of 18.7 miles. Scenery wise the walk had been great, particularly the return leg around Dedham Vale which the Essex Way has to miss as it is just in the county of Suffolk. However my foot had been really painful for much of the return and I was pleased when I finally reached the car and could take the pressure off my heel.